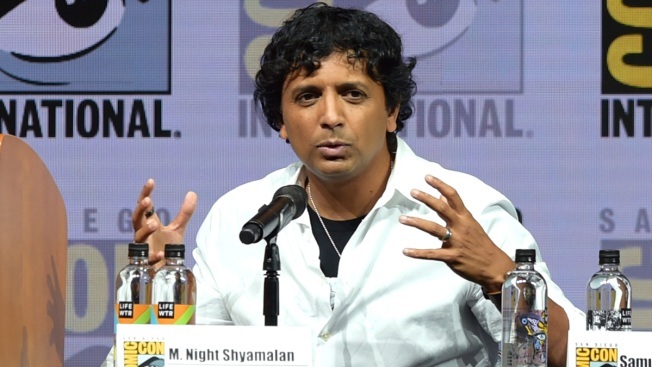 M. Night Shyamalan speaks onstage at Universal Pictures' "Glass" and "Halloween" panels during Comic-Con International 2018 at San Diego Convention Center on July 20, 2018, in San Diego, California. Director M. Night Shyamalan says he could have launched the trailer for "Glass" in front of the summer's biggest movies, but that he wanted to hold it for Comic-Con. "It was always meant for you guys," he said. The kind of people who turn out for Comic-Con and wait in the massive and sometimes overnight line to get into Hall H are the same kind who once helped turn "Unbreakable" into an enduring film even after it got lukewarm reviews from critics. "I've been dreaming about being in this hall forever," Shyamalan said. "This is the mecca right here." "Glass" melds the worlds of "Unbreakable" and "Split," two very different films about three very different superhumans, Samuel L. Jackson's fragile but brilliant Mr. Glass, Bruce Willis' strong and "unbreakable" David Dunn and James McAvoy's Kevin Wendell Crumb, who has 24 personalities. The three actors reprise their roles in "Glass." The trailer showed the three in an asylum being interviewed by a psychiatrist played by Sarah Paulson who believes that their powers are merely delusions of grandeur. All but McAvoy, who was sick, turned up in San Diego to promote the film in the convention's largest venue, the 6,500-seat Hall H.
Shyamalan marveled at how different things are for comic book films now versus when he was preparing to promote "Unbreakable" in 2000. He recalled the studio's marketing team explaining then that they were going to avoid using the term "comic book" because it was a fringe genre. "It's fascinating given what's happened since then," he said. While little was revealed about what will occur in the film, Shyamalan did tease that his film will likely be on the edge of a PG-13 and R-rating. It will be released in North American theaters in January.